During a standing-room only session at the AHRMM 2016 conference, Julie from Medtronic used a supporting case study from Fairview Hospital to focus on strategies that can be used to promote shared-savings, reduce episode spend, and most importantly, improve quality and safety outcomes. One of the key themes from the session: As supply chain professionals seek to add value to the continuum of care by transitioning from a fee-for-service model to a risk-based model, they look to their suppliers for solutions that improve outcomes and lower the total cost of patient care. But the changing landscape of healthcare dictates supplier partnerships that can provide more than just lower prices. There is a need for increased transparency, data sharing, trust and value-added services. Experts discussed strategies that promote shared-savings, reduction in episode spend, and most importantly improved quality and safety outcomes. Attendees learned how to identify shared-savings opportunities and effectively engage supplier partners, how to apply best practices to strategic partnerships between providers and suppliers, how to improve patient outcomes and achieve savings by reducing surgical site infection rates, and how to successfully collaborate with clinical staff in identifying and reducing hospital-acquired infections. Phase I: Voice of the Data, focuses on episode-based performance analytics. Phase II: Voice of Care Team, focuses on root cause opportunity identification. Phase III: Voice of the Solution, focuses on shared savings, implementation and collaboration. Throughout each phase, the hospital staff partners with a dedicated supplier team that includes clinical, data analysis and project management/lean experts. One hospital in the Southeast used this three-phase approach to realize a decrease of approximately $500K in hysterectomy costs while improving outcomes, including a reduction in both complications and length of stay. 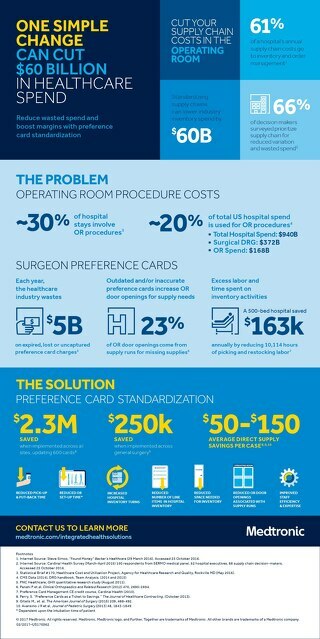 To learn more about Medtronic Integrated Health Solutions and how to transform your organization by moving from volume to value-based results, visit MEDTRONIC.COM/INTEGRATEDHEALTHSOLUTIONS.